The Hewlett-Packard DeskJet Model 340, introduced in 1995, is not only still alive and kicking but is one of the best portable printers on the market. I had used one before, and after testing a new unit just to see if there had been any major changes, I found the printer to be as impressive as ever. If you have always worked with network or desktop laser printers, you will probably be amazed at the sharp images and text that a tiny ink-jet printer such as the DeskJet 340 can produce. If you don't choose this printer for your portable printing needs, it will be because of weight or some special feature you need, not because of the text print quality, a category in which the DeskJet 340 is unsurpassed. The spot color produced by the 340 also is impressive, though it has limitations. While black-and-white images and text can be printed at a resolution of 600 by 300 dots per inch, the maximum for color is only 300 by 300. Photographs, especially ones of people, are far from perfect, although they are certainly recognizable and usable for many purposes. Hewlett-Packard's DeskJet 340 CBI color ink-jet prints 2 ppm at 600-by-300 resolution. It weighs 5 pounds, including the battery, and it's priced at $300. Some other portable printers offer slightly higher maximum resolutions, but in the real world there is little difference in the quality of the pages they produce. The exception here is in color printing when compared against printers such as the Canon BJC-80, which can print both monochrome and color pages at 720 by 360 dpi. At that level of resolution, the difference in color reproduction is noticeable. 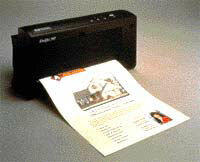 The price of the 340 is also good'near the bottom rung of portable printers. The only area in which the DeskJet might disappoint is in weight. At nearly 5 pounds, including battery, this is one of the heavier portable printers. But that's the price you have to pay for the quality construction and an estimated 25,000-page usable life. Because you will already be toting around about 10 pounds of notebook computer'including case, adapters, spare battery and power supply'the attraction of a printer that weighs closer to 1 pound than 5 pounds may justify paying more. If you're able to transport it without straining yourself, the DeskJet 340 is worth its weight.